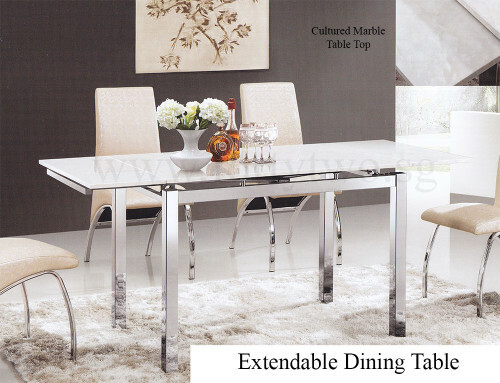 The Eufiro Dining Table exudes elegance and power. This is a table fit for an Eastern European dictator. With its cultured marble table top and brilliant chromed metal legs, the Eufiro combines timeless beauty with modern style and design. The table top is also extendable, giving it a range of options—to entertain both an intimate number of guests as well as a bigger group. 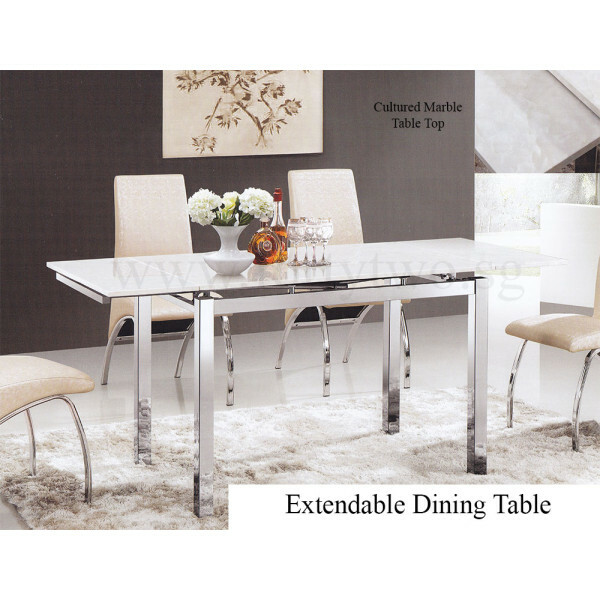 Pick up a Eufiro Dining Table today, and be prepared to hear the “oohs” of admiration from your guests. It look nice and marble pattern are beautiful. Only worrying that marble are not sketch resistance and anti-blotch . Hi, whats the color for the table top? You may refer to the first picture. At the top right hand corner they will have a small square that shows the marble design. I am sorry that we do not have a dining table which can accommodates up to the 10 seater. Unless you are talking about joining 2 tables up. With regards to the Eufiro dining table, does it only come with white dining chairs or there is an option for black matching chairs? This item only includes the dining table. The chairs have to be purchased separately.